History is packed full of fascinating figures. Some of these are men and women who were raised to lay claim to great positions—Winston Churchill, John F. Kennedy, Queen Elizabeth II. Some of these are men and women who come from nowhere and nothing but still rose to great prominence. 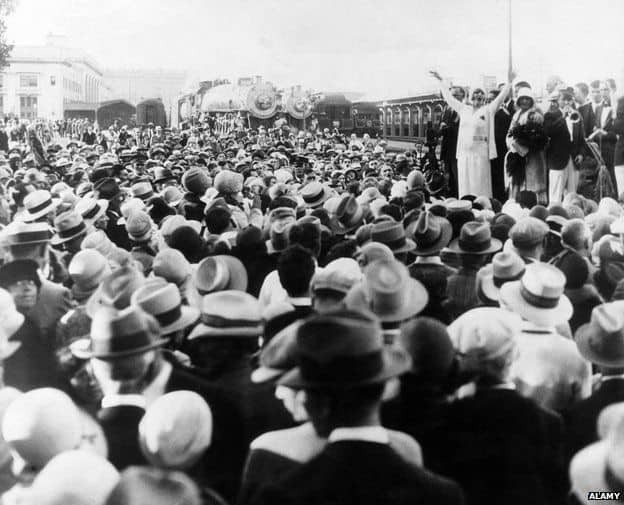 Among these we find Aimee Semple McPherson, the preacher and evangelist who may well have reigned as America’s best-known woman for much of her life. Here are a few key facts about her. She was Canadian before she was American. She was born as Aimee Kennedy in Salford, Ontario, Canada on October 9, 1890, to James and Minnie. Her parents were fully 35 years apart in age with James being 50 and Minnie 15 when they married. Minnie was enthusiastically committed to the Salvation Army and longed to go into full-time missionary service. Unable to do so because of her family obligations, she dedicated her unborn first child to ministry, convinced she would give birth to a daughter. She promised God she would give this girl “unreservedly into your service, that she may preach the word I should have preached, fill the place I should have filled, and live the life I should have lived in Thy service.” Her first child was, indeed, a girl, whom she named Aimee. She professed faith in 1907. Aimee had a conversion experience under the preaching of Robert Semple. Semple had been born in Ireland, then migrated to the United States where he encountered some of the earliest Pentecostals. He was soon baptized in the Holy Spirit, spoke in tongues, and called to evangelistic ministry. In 1907 he led a “Holy Ghost revival” in the small town of Ingersoll, Ontario. Aimee attended, fell in love with Semple, and professed faith. She, too, had an experience of being baptized with the Holy Spirit, speaking in tongues, and being called to ministry. Aimee and Robert were married on August 12, 1908. She went on mission to China. Robert felt called to China and Aimee went with him. On the way they stopped in the UK where Aimee preached her first sermon—for 15,000 people in Victoria and Albert Hall in London. They arrived in China in 1910. Aimee soon suffered a breakdown of some kind, and she and Robert both contracted malaria and dysentery. Robert died there on August 17, just two months after arriving. Aimee gave birth to a daughter, Roberta, on September 17, then returned to North America, eventually settling in New York. She soon met and married Harold McPherson whom, it seems, she never really loved. She and Harold had one son, Rolf. They would divorce in 1921. Aimee became a traveling evangelist. One day Harold found Aimee had left with the children. She had begun a new life as a evangelist, and got started in her hometown. She quickly proved she could draw massive crowds and for the next seven years, until 1923, traveled all over North America preaching before thousands and tens of thousands. The media constantly covered her events and often reported on the miraculous healings they witnessed there. Through this ministry she became one of the most famous women in America and was often written about in the newspapers. Though she later reduced the emphasis on this healing ministry, she continued to perform healing services until her death. She founded Angelus Temple in Los Angeles in 1923. Weary from the life of never-ending travel, and ready to establish a base, she founded Angelus Temple in Los Angeles where she preached 21 times each week. The church seated more than 5,000 and was often packed far beyond capacity. She called her brand of Pentecostalism the Foursquare Gospel since it was based on four cornerstones: Regeneration, Baptism in the Spirit, Divine Healing, and the Second Coming. Her most popular sermons at Angelus Temple were her illustrated sermons which were messages combined with props, music, acting, extras, and so on. Often lavishly produced, they were both entertaining and didactic. She disappeared for 5 weeks. In 1926 Aimee disappeared for 5 weeks, then reappeared in Mexico saying she had been kidnapped and held prisoner in a desert shack. She always insisted this was the truth, though many people preferred to believe she had run off with a lover. The mystery has never been solved, despite being thoroughly examined from every angle by the media and a Grand Jury. She saved lives during the Depression. During the years of the Depression she led her church to begin a Commissary which would distribute food, clothing, and other essentials without asking uncomfortable questions of those who requested the charity. In this way they fed over a million people. During other emergencies, such as great fires or earthquakes, she would mobilize her church and followers to respond quickly and generously. She spent her final years under the control of Reverend Giles Knight. As time went on, her behavior proved so impulsive and embarrassing that those around her demanded she restrain herself. To this end, Giles Knight began in 1937 to control her private and professional life, and Aimee remained under his control until her death in 1944. Though she still preached, taught, and traveled, everything was under the watch of Knight. She would sometimes call another Foursquare minister late at night to cry that she was extremely lonely but not allowed to go out. Though she was productive in these years, she was often desperately unhappy. She was also regularly ill with a variety of illnesses and suffered a number of nervous breakdowns. She rarely maintained relationships. She loved Robert Semple, but lost him after just two years of marriage. She married twice more, but neither marriage was happy and neither one lasted long. By the end of her life she had become alienated from her daughter Roberta and her mother Minnie (whose relationship with Aimee ended with a nasty lawsuit). She also had fallings out with Rheba Crawford Splivalo, who often preached at Angelus Temple when Aimee was unable or on the road, and with a host of other elders and church leaders. She had few, if any, friends. She died of an overdose. McPherson died on September 27, 1944, after overdosing on sleeping pills classified as “hypnotic sedatives.” The pills had not been prescribed to her by a doctor and no one knows how she obtained them. Though some have speculated she committed suicide, there is no evidence of this and it seems more likely she did not know the proper dosage and simply took too many of them. 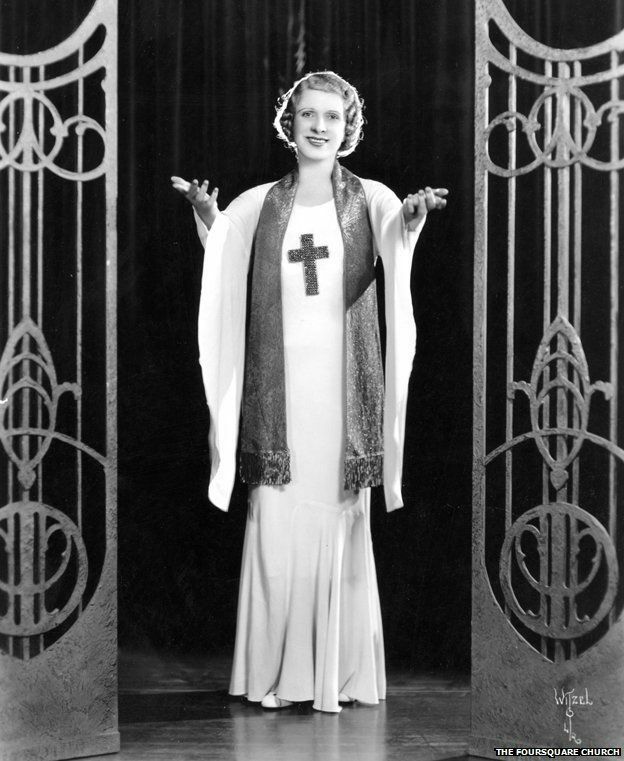 Aimee Semple McPherson is and was a troubled, troubling, fascinating figure whose fame and infamy made her an enemy to some and a hero to others. She remains an honored figure in Pentecostalism in general and in the Foursquare Churches in particular. There are now more than 76,000 Foursquare Churches across the world with more than 9 million members.